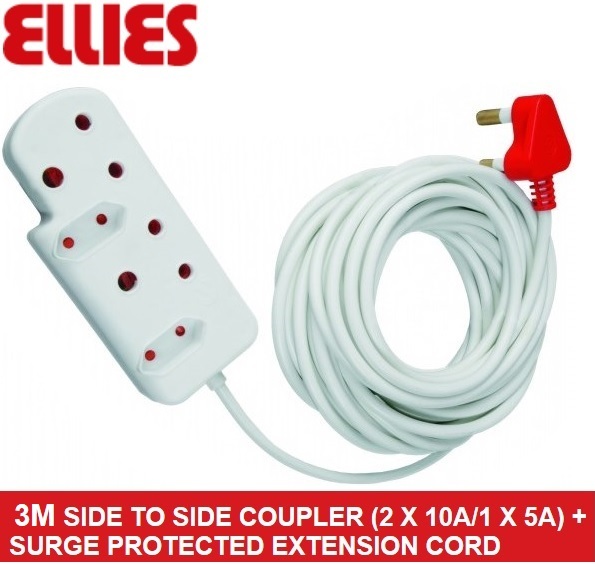 Get The Ellies Side To Side Coupler (2 X 10A/1 X 5A) + Surge-3 metres, OEM Poly bag - Today For R66 In South Africa! The Ellies Side to Side Coupler (2 X 10A/1 X 5A) + Surge Protected Extension Cord is ideal for medium duty applications and indoor use that allows you to run an extension cord across a room when its own cables does not reach an electrical outlet. This convenient power extension is great for just about any application, whether temporary or permanent. They can be setup, taken down, and stored quickly and with ease. it also has Built-in safety shutters that act as a preventative measure against children inserting fingers or objects into plug sockets and blocks out dust and debris when the outlets are not in use . The surge protection protects your equipment from damaging surges and spikes. The cable length is 3 metres. • Safety- Built-in safety shutters.